A few days ago, I stopped by to take better pics of the Haiku Santas than the ones from last year. 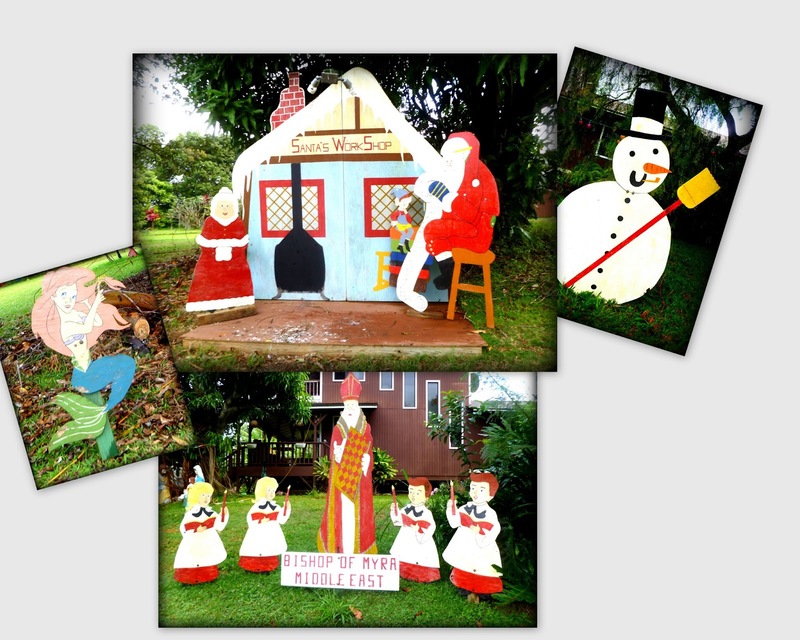 This is a colorful and homespun exhibit of larger than life painted wooden storybook Santas on the makai (ocean side) of Hana Highway in Haiku, very close to the East Kuiaha Road intersection. 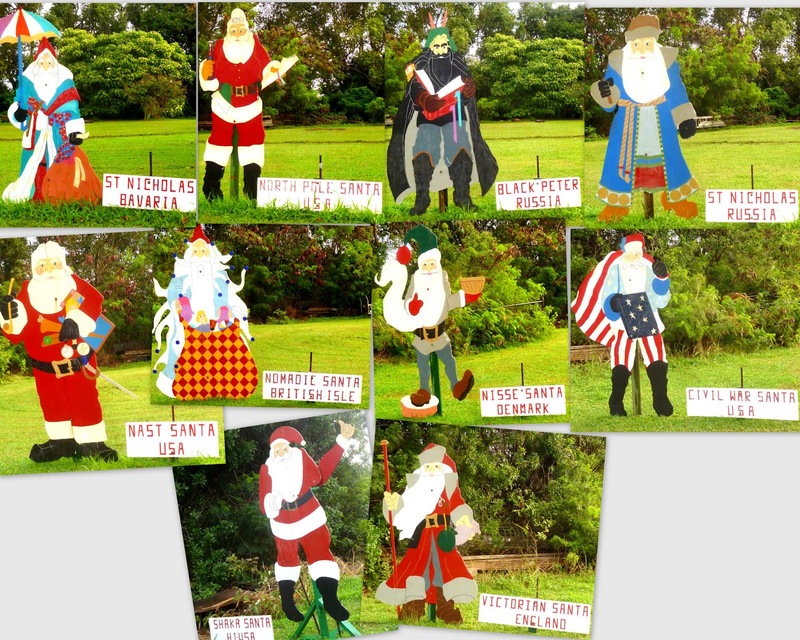 The Santas are international, from different countries, folklore traditions, and eras, including Civil War Santas, Russian Santas, and traditional Santas. Just for fun, there are some other figurines tucked in as well. To my surprise, there were some new Santas, ones that I didn't recognize. After taking several pictures, I worked up the nerve to see if anyone was home and if I could find out some history about the Santas. There was a garage door on the side, just past a gate with a big fish tail hung on it. A loud vroom vroom and cloud of dust shot out from the open garage door. As I approached, a dog barked outside. Inside stood several motor bikes and a man walking towards me. Turned out, John Torres was very friendly and happy to share the story of the Haiku Santas. His father, Louis Torres, a retired engineer, decided to celebrate Christmas in a big way. Louis had an old children's coloring book with black and white pictures of Santas from around the world, and descriptions of each Santa. Louis made the first Santa which wasn't that big, maybe less than half the size of the ones now, and his son asked if dad could make them larger. So the Santas grew in size. John said it took his dad about a year to make them, which turned into a joint venture, since his artistic mother painted them all. John says tourists stop by and take pictures, on their way to Hana or back, and are especially delighted to see Santas from their own country or culture. John said his dad passed away in '99, and he has continued to put them up every year, right after Thanksgiving. It's a big project and so he puts as many up as he can each day. John says he and his wife love Christmas and have even had as many as five trees in their home. This year, it's just two trees. But John managed to add two new Santas this year. He admitted it's been a longtime goal to add to his dad's legacy. John's Dirt Bike or Motorbike Santa. John's Tow-in Santa, inspired by nearby surfing spot Jaws. I'm not sure if the Santas are still up right now, but as long as John's around, he will put them up for every Christmas. All he needs is a guest book for people to sign (maybe protected from the rain)! If you like the Santas, spread the word. They look much better in real life because they tower above the highway. By the way, the weather has been fierce since New Year's. It's even rained in Pukalani, Kahului, and parts of Kihei. Today's been particularly blustery and rainy in Haiku.